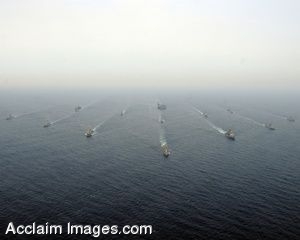 Description: Clip art photograph of The Ronald Reagan Carrier Strike Group and the Indian navy's Western Fleet sail in formation during a passing exercise (PASSEX). The PASSEX symbolized the completion of Malabar 08. Malabar was designed to increase cooperation between the Indian and U.S. Navy while enhancing the cooperative security relationship between India and the U.S. (U.S. Navy photo by Senior Chief Mass Communication Specialist Spike Call). Clipart photograph by Department of Defense Public Domain.